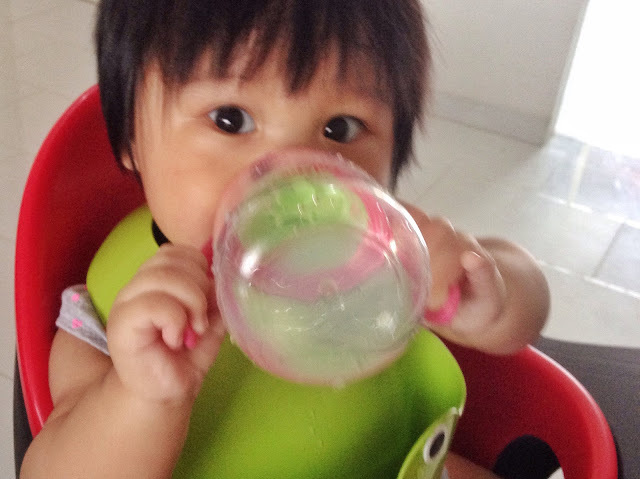 We had been giving darling the cup since she turned 6 months old. She was pretty good at handling it from the very first day, just that she didn't know how to swallow. Now, she drinks water like... Drinking water. Haha.. She's better at holding, and swallowing. She just need some more practices at aiming (she keeps hitting her mouth with the spout) and not drink so much. I'm pretty worried if there's any harm in drinking too much water. She's still mostly on breastmilk.